Cut ginger into thin slices. Halve garlic and cut spring onions into strips. Place fish onto cutting board. Working with one fish at a time, use a sharp knife to make two cuts on each side of the fish. Season fish with salt on each side. Add egg to a bowl and beat until creamy. Preheat vegetable oil in a pan on medium-low heat. Place fish into pan and fry for approx. 1 min. on each side. Add sliced ginger, spring onion, garlic, star anise, and rock sugar to the pan and continue to fry for approx. 1 – 2 min. Deglaze with dark rice vinegar. Then add red wine, light soy sauce, and dark soy sauce. Cover and allow to cook for approx. 2 – 3 min. Add water to the pan. Using a spoon, cover the fish with sauce. Cover pan with a lid and allow to simmer on medium-low heat for approx. 20 – 23 min. Shortly before serving, add remaining egg to the pan. Allow to cook for approx. 2 – 3 min. until set. 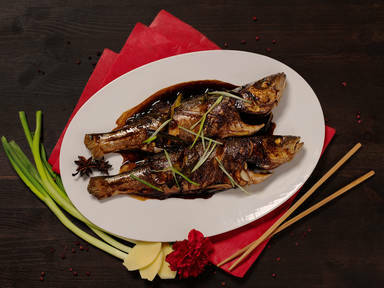 Transfer fish and egg to a serving platter, cover with spring onions, and drizzle with more sauce.